MANILA — The Philippines hopes to finish on the Top 4 of the World Juniors Tennis Championships (WJTC) Asia/Oceania Final Qualifying Round, which will be held from April 2 to 7 in Nonthaburi, Thailand. Alexandra Eala, Ma. 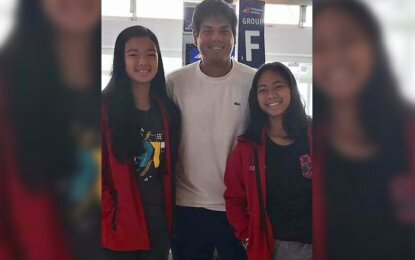 Carmencita Isabela Carlos and Julia Asaliah Ignacio will represent the country in the tournament, where the four best performing teams will advance into the World Group. “We have a very good team,” said coach Patrick John Tierro in an interview on Saturday morning. Carlos, who is currently No. 1852 in the International Tennis Federation (ITF) juniors rankings, has left for Thailand last March 26. “It also helps because Alex (Eala) and Macie (Carlos) both played in the WJTC last year, so they have experienced it already. Julia, on the other hand, is very good as well,” said Tierro, a frequent member of the national team. Last year, the team of Eala, Carlos and Amanda Gabrielle Zoleta finished sixth. In 2016, the squad comprising Eala, Carlos and Miles Vitaliano finished 13th. The 12-year-old Eala has made headlines last January when she won the prestigious Les Petits As-Le Mondial Lacoste Junior Championships in Tarbes, France. For her victory, she got a wild card in the qualifying round of the French Open Juniors in June. “I feel very proud to be representing the Philippines again and I am also very excited to compete and do my best on court,” said Eala, who is accompanied by her father, Michael Francis. “Since it is my third year in WJTC, I more or less know what to expect in terms of the level of tennis and we did well last year so I hope this year, we can get to the Top 4,” said Eala, who joined the Women’s Tennis Association (WTA) Future Stars Tournament Asia-Pacific leg in Singapore two years ago. Eala, who is almost 5-foot-7, made an impressive showing as member of the International Tennis Federation (ITF) Under-14 touring team to the Young Stars Tournaments in Europe last year when she won five doubles titles. “The Europe tour was great because it was also a new experience for me. There were different sets of opponents and world class tennis environment,” said Eala. Her short-term goals are getting into the world juniors main draw, do well in the French Open qualifying and compete in other ITF tournaments when she turns 13. Carlos, on the other hand, has competed in Thailand, Cambodia and Nepal since joining the ITF Juniors Circuit last year.